SAP To Post Revenue Higher Than $34 Billion In 2020? Will SAP’s Cloud Business Continue To Drive Its 3Q Performance? What Is SAP’s Revenue And EBITDA Breakdown? SAP (NYSE: SAP) after the 3rd Quarter results raised its 2018 outlook for the third time in the year on the back of strong growth reported. The company reported 10% growth year on year (YOY) in Total revenue with Revenue from Cloud subscriptions and support leading the way with a 41% growth YOY. The company’s traditional premise license revenue remained strong by recording a 6% growth YOY. Operating profit also grew at a 11% YOY. 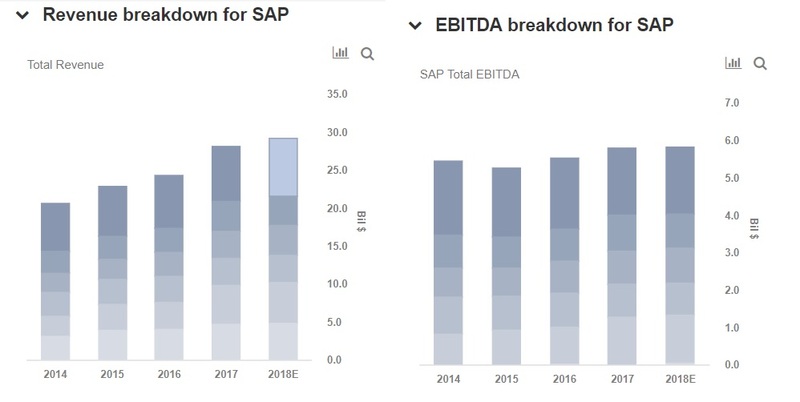 We have created an interactive dashboard on SAP’s Revenue and EBITDA breakdown, which details our forecasts for the company in the near term. You can modify our assumptions to see the impact any changes would have on the company’s revenue and EBITDA. We expect SAP to generate a Total Revenue of $29.18 billion with an EBITDA of $5.82 billion. We have divided the revenue stream for the company into 5 segments. The resource planning software segment (ERP) is expected to contribute revenue of $7.52 billion, while Customer Relationship management software will contribute approximately $3.83 billion, while Supply Chain Software revenue about $3.37 billion. Business Intelligence is expected to continue to grow and contribute $3.61 billion to total revenues. Professional services and other software revenues should approximately give $4.83 billion and $5.43 billion, respectively.